A delicious and simple breakfast, lunch or dinner. 1. Preheat oven broiler to high and place rack in top third of oven. 2. For each omelette, proceed as follows, making one at a time. Preheat a well-seasoned cast iron pan over medium heat. Add 1 tsp vegetable oil and 1 tbsp butter to pan, swirling to coat bottom evenly. In a small bowl, whisk together 3 eggs till smooth and evenly combined. Add 1 tsp grated Parmesan and 1 tsp chopped chives, and mix gently taking particular attention not to bruise the chives. As soon as the hot butter stops bubbling, pour the egg mixture into the pan. Season surface lightly with kosher salt. 3. With a heat resistant spatula, gently move eggs around the pan, from the edges to the center, allowing the egg to run evenly across the pan. Place the pan into the oven and broil until top is just barely set, but not starting to colour, just under a minute. 4. 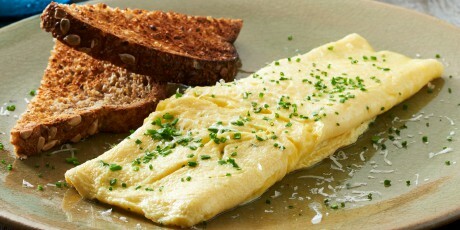 Carefully and quickly flip omelette out onto a plate and fold into thirds like a letter, seam side down. Garnish with additional grated Parmesan and chopped chives. Serve warm with a side of hot buttered toast.